Following a flurry of activity in October, the WaW Committee met early in November. We reviewed the outcomes from the four walks we had arranged in October, which had been joined by more than 50 people in all. Given the success of these, we discussed options for another walk, probably on New Year’s Day, but certainly after Christmas and before the end of the holiday period - watch this space! We are pleased to have started to set up links to local businesses, with three nearby businesses which offer accommodation (Glendower House, Greenbanks and Lynn Hill) agreeing to put our link on to their own websites, while we do the same for them. We have followed with interest the moves to update the road signs along the A47 on the approach to the town. 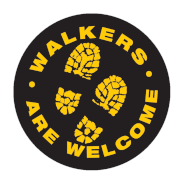 We hope that any updated or new signs can include an advertisement of the town’s new status as a Walkers are Welcome town. Such a move would tie in well with our own proposals to add ‘Walkers are Welcome’ signs to those on the other roads leading into Dereham. Two of the Committee had been to the national Walkers are Welcome AGM weekend in Lincolnshire in October, and brought back information about that event, including a big pile of other towns’ leaflets to be used as a source of inspiration and ideas. drawing up a presentation talk and slide show which we could offer to interested groups and events. Our next meeting will be used to work out just what we will aim to do in the New Year.